Here's more on the historical stargazers portrayed in the film, Edward Emerson Barnard and William Herschel. Edward Emerson Barnard was one of the hardest working, most driven scientists in the history of astronomy. Historian Donald Osterbrock called him an "observe-aholic," because Barnard, happiest when he could spend all night observing, was moody and difficult when the sky was cloudy. He disliked taking vacations and lived for his work. Some of his problems came from his impoverished youth; Barnard had to drop out of school and go to work to help his widowed mother. He got a job as a photographer's assistant, eventually developing an interest in photography and astronomy, fields which he would combine as his great life's work. After taking courses in astronomy at Vanderbilt University, Barnard began to hunt for new comets—in part because a prize had been offered for new comet discoveries, and he needed the money to make the mortgage payments on the small home in a poor neighborhood where he and his bride lived. Comets literally put a roof over the young couple's heads, as Barnard discovered 17 of these icy cosmic visitors. During this period, as many devoted comet hunters had done, he also found a few fuzzy-looking objects in the sky that at first seemed to be comets, but weren't. These turned out to be nebulae (far more distant objects)—some of which we now know to be clouds of star-forming gas and dust, and others to be whole galaxies of stars. One of Barnard's 1884 discoveries, now called "Barnard's Galaxy," is a small faint galaxy which is one of our Milky Way's nearer neighbors. 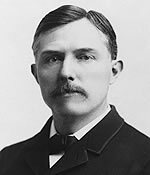 In 1887, Barnard sold his home and moved to Northern California to take up a position at Lick Observatory, where the largest refracting telescope in the world was going into operation. With it he found the fifth moon of Jupiter, in 1892—the first satellite of the giant planet discovered since the days of Galileo. This earned him world renown, and—perhaps even more importantly—more time on the big telescope. 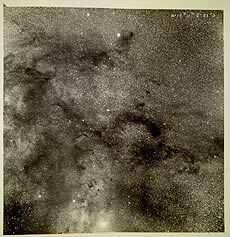 Dark clouds in the Milky Way, from Barnard's Photographic Atlas of Selected Regions of the Milky Way. Courtesy of the Georgia Institute of Technology Library and Information Center and the Observatories of the Carnegie Institution of Washington. Over the years, Barnard perfected techniques for taking clear, long exposures of the star-lanes that outline our Milky Way Galaxy. It was on these superb, pioneering photographs that he began to study the dark patches that interrupt the streams of glittering stars. He was the first to realize that these dark patches, rather than being empty regions, were clouds of dark gas and dust. Today, we know these dark clouds harbor most of the material from which new stars and planets will form in the Milky Way. In 1916, Barnard discovered the second closest star system to the Sun. This star, which moves across our sky faster than any other, is now known as Barnard's Star. This is a departure from astronomical tradition, where most stars either have names from ancient mythology, or no names at all. The old observe-aholic would surely be pleased with that. Cruikshank, D. "Barnard's Satellite of Jupiter." Sky & Telescope, Sep. 1982, p. 220. On the discovery of Jupiter's moon Amalthea and Barnard's life in astronomy. Jakiel, R. "The Man Who Tracked Nebulae." Astronomy, May 2001, p. 52. Introduces his life and career and then focuses on his work with a particular galaxy. Mumford, G. "The Legacy of E. E. Barnard." Sky & Telescope, July 1987, p. 30. Sheehan, William The Immortal Fire Within: The Life and Work of Edward Emerson Barnard. 1995, Cambridge U. Press. The definitive biography. Sheehan, W. "E.E. Barnard's Magnificent Milky Way." Astronomy, June 1996, pp. 32-39. Tenn, J. "Edward E. Barnard: The 14th Bruce Medalist." Mercury, Sep/Oct. 1992, vol. 21, p. 164. Verschuur, G. "Barnard's Dark Dilemma." Astronomy, Feb. 1989, p. 30. 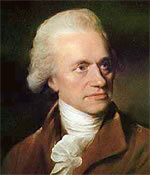 William Herschel was probably the most successful amateur astronomer of all time. A composer and musician by profession, he was self-taught in astronomy, but he had the skill and devotion to become the most celebrated astronomer of his day. Born in Germany, Herschel escaped to England and made a career of playing, conducting, and teaching music. But reading a book by James Ferguson on the heavens aroused his interest in astronomy, and he began to construct larger and larger telescopes. His inquisitive mind roamed over many parts of astronomy and his observational persistence (assisted by his hard-working sister, Caroline) paid off in many pioneering discoveries. In 1781, Herschel became the first human being in recorded history to discover a planet. All the planets known to that point were visible to the naked eye, and could be seen by anyone who followed the patterns of the sky. But Herschel was the first to find a new planet with a telescope and it made him an instant world celebrity. As a tribute to the monarch of his adopted country, he proposed to call the new world Georgium Sidum, Latin for George's star. This was a big hit with King George III, who awarded Herschel a life pension to allow him to do astronomy full time (although he made and sold telescopes to supplement his income and eventually had the good sense to marry a rich widow). The proposed planet name was, however, not much to the liking of astronomers in other countries, who insisted that the new planet be named after one of the Roman gods, as the others were. The name selected was Uranus, after the father of Saturn. In 1800, Herschel made a discovery whose importance would not be clear for many years, when he did an experiment to measure the temperature of different colors of sunlight. Using a prism, he broke the white light of the Sun into the colors of the rainbow (the spectrum) and saw that the different colors had different temperatures. To his amazement, he found that the temperature of sunlight was actually hottest beyond the last swatch of red, where nothing was visible to his eye. He reasoned that there was light energy beyond the red color, but our eyes were not able to see it. What Herschel discovered was infra-red light, now known to be one of a whole family of invisible waves that, together with the light our eyes know and love, makes up the electro-magnetic spectrum. By the way, the infrared light Herschel discovered is the kind emitted by the remote control units of TV sets today. Herschel built larger and larger telescopes—eventually fashioning a reflector with a 100-cm diameter mirror (about 40 inches), the largest in the world at that time. With these large telescopes, he could see fainter objects than had ever been seen before. He discovered two moons of Uranus and two moons of Saturn and between 1783 and 1820 began to make an exhaustive catalog of nebulae (fuzzy objects) in the sky. Eventually, he and Caroline compiled a listing of 2500 nebulae, which then allowed a serious discussion to begin as to what these fuzzy objects were. (See the web pages on the Orion Nebula and the Andromeda Galaxy for more on this issue.) Herschel also studied the number and arrangement of stars in the sky, with particular attention to the Milky Way, the great river of stars seen flung across the sky. Seeing that the band of the Milky Way had more stars than other parts of the sky and that this band encircled us, Herschel correctly guessed that the system of stars was arranged like a flat wheel or disk. (Today, we would compare the arrangement to a frisbee, but there were no frisbees in Herschel's time.) Herschel counted stars in all directions around the Milky Way band, and seeing that the numbers were the same, he concluded that we must be close to the center of the great wheel of stars. We now know that he was misled by the fact that great clouds of dust block our view toward the center of the Milky Way. While light does not penetrate the dust clouds, the infra-red waves Herschel discovered do. With their aid, we now know that we are not in the center of the Milky Way Galaxy (as the great wheel we live in is called.) We are in fact in the galaxy's suburbs, about 3/5 of the way out. Herschel made many other discoveries, including measurements of the length of the day on Mars and the existence of double star systems where the stars were so close that they moved around each other in an intimate gravitational ballet. By the time Herschel was ready to hand the family astronomy franchise over to his son John (who became a noted astronomer in his own right), it was clear that his discoveries had changed humanity's view of cosmic possibilities forever. Ferris, Timothy Coming of Age in the Milky Way. 1988, Morrow. Chapter 8 focuses on Herschel and others. Hoskin, M. "William Herschel and the Making of Modern Astronomy" in Scientific American, Feb. 1986, p. 106. Jones, B. "William Herschel: Pioneer of the Stars" in Astronomy, Nov. 1988, p. 40. Kolb, Rocky Blind Watchers of the Sky. 1996, Helix/Addison-Wesley. A history of astronomy, focusing on several of the key scientists. NOTE: One of Herschel's original musical compositions is heard in the film Seeing in the Dark. You can find CD's with more of his music on classical music catalogs and web sites. However, nobody seems to think that he was as important a composer as he was an astronomer.